Everybody Will Be in EVERYBODY’S business – early on in the transition you’ll experience the “blob.” Everyone involved in the reorg will pretty much be stuck in the same place. Vertical guys will want to define products, LOB’s will want to do their own sales and marketing, etc. It will take time for the “blob” to spread out. Give it time. Lane Violations – as the “blob” starts to spread out people will begin to find their lane. The challenge will be those who refuse to stay in their lanes. Lane owners will need to be protective of their space and tell others to “get out”…easier said than done. Learning Curve – just because you’re the new head of a Vertical or LOB doesn’t mean you know how to do the job. You’ll find that it will take time to truly understand what you are supposed to do…try 6 to 12 months. Marketing, Selling, Scoping Work, Pricing, etc. – all these functions will be debated over and over…where they best fit, who should do what, at what point in the process, etc. Compensation – the elephant in the room. Yes, it will look easy on paper…Verticals = revenue…LOB’s = profit and/or contribution…Services = customer loyalty/satisfaction, but boy does it get messy. It should create a healthy tension in the organization as long as its proactively managed. This one will take time to sort out and all those lane violators will want to make up their own rules and/or change the ones that exist. At the end of the day, err on the side of the customer and/or what makes best sense for the organization. Clear Definitions on the Role/s – almost everyone will get the logic and/or rationale for the change and intuitively understand what they are suppose to do. The challenge is they may not, or most likely will not, know how to do it. I’ve seen this story a dozen times….create the org chart, make the announcement to the company; lay out some targets…now go. The missing piece? No one has given anyone instructions on how to do their job. Invest the time to be crystal clear on what and how you want the job to be done. It will go a long way in keeping the “lane violation” from causing problems. Hiring From the Outside – it’s taken me a while to come to this but I think you may be better off hiring new blood to run the Verticals, especially if they are new. If your business is product focused and has been aimed at one or two specific industries consider hiring in talent from the industry you want to penetrate. Verticals Go Forward – the role of the vertical should be to understand the needs of the industry/customers (market sensing), the positioning of competitors, manage pipeline, and position the organization/product/services value proposition to be successful. They may also own account management activities. If they do, a line should be established on how big an account should be to warrant that type of coverage (more on that later). Notice I didn’t say develop products and/or services because they shouldn’t! Vertical folks will be invaluable resources for informing new products/services and adapting existing, but they should not drift into the LOB lane…they own products. If done right they should have an idea of what customers will be 2-3 years out and should challenge the organization to catch up with offers. LOB’s Go deep – the role of the LOB should be to develop a standard set of products and services that fit common needs of customers across industry and meet a defined profit target. They may or may not own the P&L, it depends on the industry but they should control PRICING. Enabling the sales organization (the Vertical) with good content to support their business development efforts and informing the services/solution organization on their needs is core to their role. LOB’s should also understand which channels support what products/services and provide them with the right funding/incentive model. Services and/or Solutions Go Long – this group may often feel like the orphan in this new model but don’t neglect their needs, voice or insight. Most likely, they know the needs of the clients as well or better than the verticals, and how well products/services/solutions actually work. This group should focus on serving the needs of existing customers and finding ways to improve, strengthen and expand that relationship. Not every ‘customer’ needs to be in a Vertical – small and some medium customers don’t need and/or fit into a Vertical. Their needs may not be that unique and/or warrant the type of coverage of other larger customers. Additionally, if you’re deploying a geographic coverage model it just doesn’t make sense in some areas. A dense concentration of customers like the Northeast can support a vertically aligned sales force but in the upper Mid-West…forgettaboutit. Run the territory models on what makes sense. Click on the image above. Now this is how you market in a down economy. Over the past year I’ve focused on the virtues of Web 2.0, but it’s time to give a “shout out” to ol’ school direct marketing, especially when it’s done this well. It’s from Boden, a children’s clothing catalog company. Quick Service Number – immediately connected to my account info…they know me as a customer…and that I’ve bought (a lot apparently) in the past. Most likely, it also serves as a tracking code. Bonus incentive: if I use it when I call I will receive free shipping, which would probably be the case anyway but they’ve given me an incentive to give them the tracking code. The Opening Sentence/Paragraph – it’s about me (actually, my wife) right out the gate. You’ve maybe got 2-3 seconds to connect with the reader nowadays, and you can’t start out with what you want or who you are because the reader doesn’t care. I also know what you thinking, how is it that your wife shared a letter like this given the comments that we bought “armfuls” last year and we were “one of their best customers.” Two reasons; 1) she’s an ex-agency person and appreciates a good piece like this, and 2) the letter mentions that we’re not buying as much this year…there’s the positive spin. Use of Levity/Comedy – this is extremely hard to do well and it is a bit edgy but I love it…makes you want to read more. The use of British humor (this is a UK based company) also adds to it. Folks have been saying for a while that the best creative has been coming out of London. Got to admit I’m seeing more and more evidence of that…but I also have to giving credit to the Geico Gecko (the Martin Agency) for paving the way here as well. Personalization – from the owner/founder Johannie Boden herself. Have no idea what her first name is or even if she’s even a real person… could be Tommy Bahamas’ sister for all I know, but I like the personalization. Hands down, DM from an individual to an individual always has the best response rates. Writing good copy that sounds likes it’s coming from a real person and not just a signature, that’s another story…maybe even another post. Customer Buying Behavior – they’re obvious tracking and have noticed a change in my wife’s habits; this is critical in a down market. Watch your best customers and their transactional behavior…probably should have started last year but it’s never too late. The Solution/Offer – Look up DM best practices and “the experts” will tell you that you should test multiple offers… 50% off, half off, or buy one get one free, and you should, but in today’s economy real dollars savings is a real winner. Simple, tangible and it can be combined with other promotions. “Ol’ whatshername” came up with a custom solutions just for us. She determined that the most likely reason we haven’t been buying lately is price –and she’s dead on…their cloths are on the high end. Back to school this year meant going to Macy’s with a hand-full of 10-20% off coupons. Limited Time Offer – yep, got to have it. And the time period is getting shorter and shorter. Seeing an interesting trend with the use of limited time offers. This use to be the go to “hook” for PC manufactures and mass merchandisers now I’m seeing it in all kinds of retail situations, and most interesting is it’s use in fund raising. Mobile opens up a whole new dimension look for that next year on Google’s G1 phone. Instant offers feed by GPS that expire very quickly…use it now or lose it. 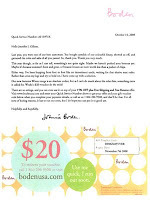 Creative – notice that the offer gets a third of the page, and is very colorful with offsetting large and small images. The $20 offer is supersized and next to information on where to redeem it. Your eyes are drawn to it immediately and it’s the motivator that determines whether you’ll invest the time to read the text above it. It is also perforated and complete, so if I only read the offer and tossed the top, I would have everything I need to understand and use it. Notice how they personalized the offer…”…I run out soon.” Love it! At the end of the day the ultimate measure of good DM is performance/results. In my house, it killed but then again we were an easy target…they knew us all too well. Pick up any book on Customer Service and the first tip on how to improve or provide a good customer service experience is to “listen to the customer.” This advice is so incredibly obvious and intuitive that you shouldn’t need a book to tell you. Yet putting it into practice is incredibly hard to deliver. Why? Recently, a transportation company set out to answer that question. Our task was to discovery the key to delivering a “good customer service experience.” We surveyed over 500 customers, conducted multiple focus groups and held one-on-one interviews. And after all that data collection, what did the customers say they wanted? They wanted the company…are you ready for this…”to know them.” Know them personally and their business. Defined by having an understanding of their business so that you can anticipate their needs, and as a result, be a valuable partner. Doesn’t sound too difficult to deliver, right? In this case, it was. The company had no customer service standards, and no rules to govern customer interactions. They also lacked a centralized customer database to capture and archive customer conversation and data. To make matters worse they delivered customer service in a decentralize environment with over 100 centers, all operating independently. Given that scenario you would think that this company could implement some simple fixes that would have a big impact—some simple fixes. But first you must understand how the company got into this situation in the first place. At its core, this is an operations driven company, and customers can sometimes get in the way of efficiency. Their culture and core operating model was to move a box as quickly as possible from point A to B without damaging it. Customers who have special needs and/or require assistance slow down the process. In this environment, delivering good customer service can be too costly and/or too inconvenient. The insight was that the (logistics) process was found to be more important than the customer. Internal systems (or lack of), compensations, key performance indicators were all designed to move freight, not to measure customer satisfaction. The feeling was that if a package made it to it’s final destination on time, and in reasonable shape, customers would be happy, and for the most part they were. It’s when that process broke down that customers wanted more. They wanted the customer service rep to know them, their company, their issue and have a solution. And with that, the company had its answer. The challenge that remained was to change the corporate culture. Unfortunately, that turned out to not be as easy as going from point A to B.